Rice hosted a groundbreaking ceremony Sept. 13 for the Patricia Lipoma Kraft ’87 and Jonathan A. Kraft Hall for Social Sciences, a new home for the School of Social Sciences. The building will be named for Patti and Jonathan Kraft, the lead donors for the project. Bobby Tudor, chairman of the Rice University Board of Trustees, opened the event by welcoming everyone and thanking the donors and volunteers who made the project possible. He acknowledged the Krafts along with Doyle Arnold, who led the fundraising committee, and Rich and Nancy Kinder, who were unable to attend the event but have been longtime supporters of Rice and the Kinder Institute for Urban Research. He also acknowledged the architect for the project, Rob Rogers, a 1981 graduate of Rice’s School of Architecture. Tudor then introduced Rice President David Leebron, who talked about the university’s aspirations to build on the vision of its first president, Edgar Odell Lovett. Antonio Merlo, dean of the School of Social Sciences, followed Leebron to the stage and remarked on this “tremendous milestone” for the school and echoed Tudor and Leebron’s thanks to the Rice board, the School of Social Sciences advisory board and members of the Rice Initiative for the Study of Economics Council. 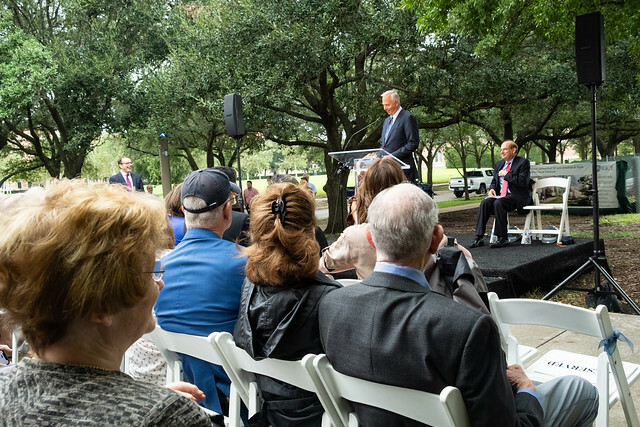 “I’m honored to be a part of creating a home for our students, faculty and staff — one that will serve as a point of connection between our scholars, community, the city of Houston, the state of Texas and the wider world,” Merlo said. He also thanked the Krafts and other alumni and friends who have supported and championed the building project. “Your generosity means so much to our talented students and faculty, and strengthens our vision for what a top-tier social sciences program can achieve,” Merlo said. Merlo then welcomed Patti Kraft to the stage. “Jonathan and I are so happy to have our name on the social sciences building and are honored to be among all of you who have done so much to bring Rice to this point,” Kraft said. She went on to discuss Rice’s impact on the trajectory of her life.